The legendary PD-55. For nearly 40 years, the PD-55 and its predecessor - the PD-50 have been the productivity leaders in post driving. At just 54 pounds and with a 3-1⁄2" piston, the brutally tough PD-55 is capable of handling your toughest applications quickly and efficiently. 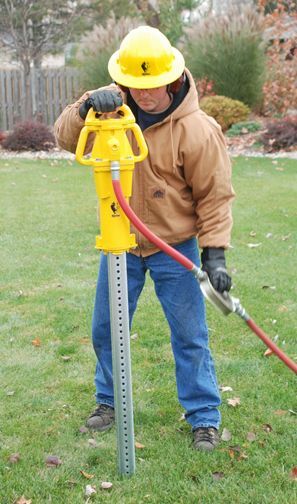 The PD-55 is ideally suited for driving t-posts, ground rods, tent stakes, grape stakes, delineator posts, form pins and fence posts up to 3-5⁄8". Simply the basics. This kit is designed to provide the simple requirements to begin post driving. Full Kit Ready to Go. Transport your Driver, Chucks and Accessories. Choice of 4 Chuck Adaptors. * Chuck adapter selection is customizable. 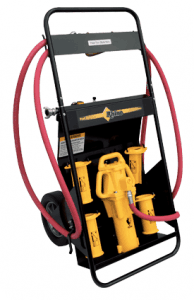 Designed to outfit a utility vehicle with the essential elements to allow crews to quickly and efficiently disembark a vehicle and perform required tasks. Full purpose transportable kit. Ready to tackle any job quickly. Choice of 4 Chuck Adaptors. Full purpose transportable kit - when you already have a PD post driver. Choice of 4 Chuck Adaptors. Ductile iron casting, high in strength and ductility has a 1" (25.4 mm) diameter handle designed into the cover for easy handling and carrying. O-Ring sealed. Ductile iron casting, with excellent wear resistant characteristics. The air inlet is cast into the body and tapped with 3⁄4" NPT female threaded ports, along with 1" (25.4 mm) diameter ergonomically designed side handles for easy handling and carrying. Chuck bolts pass thru the lower body flange into tapped holes in the chuck mounting plate allowing special chucks to be made in a wide variety of shapes and sizes. 3-1⁄2" - Alloy steel heat treated with a ground surface with hard chrome plate. Designed with 2 round valve ports to give better lubrication and load distribution to the valve ring while running. The 3 7⁄8" (98.4 mm) I.D. master chuck is of an all welded, reinforced steel and tubing construction. The chuck is equipped with extra long chuck adapter attachment lugs. S.A.E.Grade 5 bolts with belleville lock washers. All fasteners are plated. 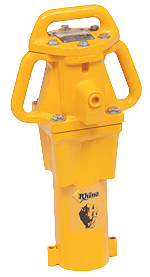 Each unit includes a Rhino Stainless Steel Throttle Valve. The valve is equipped with a lever lock for safety. Standard chuck adapters are available in the following sizes: 1" (25.4 mm) I.D., 1 1⁄2" (38.1 mm) I.D., 2" (50.8 mm) I.D., 2 1⁄2" ( 63.5 mm) I.D., 3" (76.2 mm) I.D., 3 1⁄2" (88.9 mm) I.D. and three channel post chuck adapters for 1.2 to 1.5 lbs/ft, 2 to 2.75 lbs/ft and 3 to 4 lbs/ft posts. 42 CFM (1.19 m3/min) @ 90 PSI (6.4 kg/cm2). Post and Sign Driver Equipment and Supplies.